Nellies Fishing guide, and the scripts i use. Lots of people seem to have started fishing recently, i have been fishing for quite a while now, so i thought i would share my fishing style and the scripts i use to do it. I generally don't like afk scripting and will never leave scripts running overnight or whilst i am at work. I also don't like scripts that make it look like your scripting i.e. recalling to the bank to drop stuff off regularly ect. So first off i run 3 accounts. 2 are using Archangels Modified for Tokuno ship fishing script, these run collecting mibs and nets, and even maps for points, i used to collect the fish too until i got to a million stones on my doorstep, at that point i just started cutting them up. When i have at least 500mib i open them all manually, and then use Kal In Ex's SOS master to sort them into the 10 area's (I have 10 numbered bags, sometimes need 2 for area 9, its small but has tons of SOS) i tend to save all my ASOS until i have a lot at least 50 and then do all the ASOS at the same time. When my mules are full i take them to my nearest bank and use a chest cleaner script that doesn't seem to be available anymore, But i am sure there are chest cleaners out there that work just as well as the one i have. The one i use empties all the scrolls/regs/gems into 3 bags, i then sort the rest by hand (None of the Armour/rings i have ever found has ever been useful so that stuff stays in the chest) I only save Fort/Invul scour's ect or you end up with too many. If you want to run your Fishing script 24/7 without interaction when collecting mibs i would suggest using TM's Fishing script, i havent used it, but from what i have seen it runs well without interaction, and there is no need to constantly be looking at your hold to see if it's nearly full. Re: Nellies Fishing guide, and the scripts i use. My new script has a chest sorter (thanks TM) with it that moves regs, scrolls, and gems to specific chests/bags that you choose. It can also be easily modded to move specific things from your backpack or another container into a trash barrel for points. It is a full script now instead of a snippet. I run very similar to Nellie but love the idea of bonded packies on board. I use a small ship for the ease of movement though the hold is tiny. 1. I run TM's FAF http://www.scriptuo.com/index.php?topic=41.0 and let it go until I have about 100 mib's saved up. This script rocks and needs very little supervision. My fisherman is gm mage with reptile slayer spellbook and never dies. 2. I use Kal's SOS Master https://www.easyuo.com/forum/viewtopic.php?p=97820#97820 to sort the SOS into the 10 quadrants. I made a rune book with launch points for each of the 10 areas. I take the bag with the SOS for that quadrant and recall to the launch point. I launch the boat and then fish them up. I fish up 4 at a time and keep them in the hold, sending the gold to my bank with bag of sending. 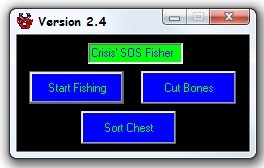 I use my SOS Fisher http://www.scriptuo.com/index.php?topic=9770.0 to fish up the chests, cut up bone piles, and sort the chests. 3. Once I have 4, I take them back to my house and sort the regs, gems, and scrolls into the appropriate chests. I take out the special fishing items, such as the bow, leggings, wedding dress, grape vines and new hardeners and put them into other chests. I put some of the fished up things (from a shipwreck) on a vendor and donate the rest to the trash barrel along with the maps for cleanup points. I put the chests with weapons, armor, and jewelry into storage chests for my imbuer to unravel later. 4. I keep fishing up the SOS until I am out and then I go back to step one. I make millions off of the gold in the chests, then sell a lot of the items for more gold, and finally buy things with the turn in points and sell those as well. The method I use is somewhat similar to Nellies'. Biggest difference is that I use a Brit ship and fill the deck up with chests. I will pull the gold out of a chest and put it in its own stack, then I will put fished up loot into the chests on the deck. I also dump the next fished up chest into the previous chest until the item count is at about 100-110. After that I stack on top of that chest and the cycle just keeps going. After about 50 chests have been fished up I go grab bonded packies and haul the loot home to my imbuer. I am less than two months in on this setup and already up to almost half a million clean up points. I don't even keep the Runed Driftwood Bows, Kelp Woven Leggings, or the Bronzed Valkyrie Armors anymore. They are good points to turn in and since they do not give relics when unraveled why keep them? After dumping the chests at home I head back out for another 50 or so chests. What's a decent fisher template, and how long does it take to train fishing? This is something I've never done, kind of interested though. Depends entirely on if you plan on scripting it or not. If you are gonna script it you wanna go magery. No other skills needed except Eval and Med of course. Fishing is pretty self-contained. and how long does it take to train fishing? Again it depends on how you plan on training it. If you buy the skill up and then just script away with the shore fisher until you can deepwater fish you will never notice the time. You start fishing up MiB's at like 65 now. I know when I got my 120 fishing scroll it was just two nights while I slept to go from 110 to 120. The template is pretty easy, the most common being mage/fisherman and archer/fisherman. Training is very simple. Once you can fish in the deep sea, which is 75, I used TM's FAF script. I used FAF all the way to 120 collecting tons of things for clean-up points and tons of MIB's. It didn't take long, I think 2 days or so but it was almost non-stop. I have room on both but since I only fish with them, I haven't bothered to fill their templates. FAF supports both magery, chivalry, and archery which is awesome. I use a reptile slayer spellbook on my mage/fisherman and then an imbued reptile slayer bow on my archer/fisherman. If you have any other questions, let me know! Hmm... I think I'll give this a whirl! Awesome thread! I've been intending to get back into fishing now with all the changes, still haven't actually used anything from my High Seas purchase lol. While fishing I just used Mind Blasts since there was no Eval required. It sounds like I'll need to add Eval at minimum and prepare for tougher than a Sea Serpent? Still easy to fit on this template. Plus the jump to 120 Fishing of course. I would definitely go with gm eval for fighting. Use a reptile slayer spell book and you will be fine. Use a reptile slayer spell book and you will be fine. Or snake slayer. It might be easier to find. And a snake slayer works better! Thanks for this info. I am going to try today. Does it work with the new boats?